‘Like myself’, Senator Large, who was just over five feet, once remarked: ‘my contribution to this debate will be very brief’. What was even more worthy of remark was the manner of his being elected to the Senate in the first place. William James Large was born at Northfleet, in the County of Kent, on 28 March 1878, son of Sophia Large, née Lancaster, and James Large. James was a fitter who, his son told the Senate, was forced to tramp the length of England looking for work because his union activities put him on employers’ blacklists. Despite this, Mr and Mrs Large managed a secondary education for their son at St Botolph’s Church of England School, Northfield, and he afterwards found employment at Vickers’ armament works. It was then that he became seriously interested in politics, and before leaving England joined the Independent Labour Party. He arrived in Sydney in 1908, and found work as a labourer on the north coast of New South Wales with the British–Australian Timber Company. The company then employed him at his trade after he won the right to payment at the rates demanded by the rules of the Amalgamated Society of Engineers (ASE), which he joined in 1909. Soon after, he returned to Sydney, and on 4 March 1911 married Clara Mary Ann Osborne, a thirty-year-old dressmaker, at 669 Dowling Street, Moore Park, in accordance with the rites of the Congregational Church. Mr Large has been associated with all movements of progress in the district. He was one of the two main organisers responsible for Carr’s Park [a two-hectare waterfront reserve] being resumed. He joined the Blakehurst Progress Association for that purpose. He took a hand in establishing school facilities in South Hurstville, and the equipping of St George District Hospital with radio apparatus. He added to his many other achievements a position as a member of the first advisory committee on technical education in NSW. He is keenly interested in all forms of sport. Billy Large, as he is affectionately known, has always been a staunch Unionist, and is proud to possess the certificate of merit from the AEU. The Propeller’s piece was written to acquaint the electors of Barton with the record of the man who was one of the officially endorsed Labor candidates for the Senate at the 1940 elections. The record is a worthy one, but there is nothing in it that would explain why the state executive of the party would allot him third place on its ticket, and so ensure him a Senate seat. The explanation lies in the internal politics of the electorate of Barton, and the political ambitions of Mr Justice Herbert Vere Evatt. 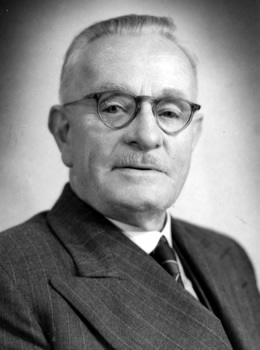 Evatt’s interest in Labor politics went back to the 1920s when he had been the Member for Balmain in the New South Wales Legislative Assembly. In 1930 the federal Labor Government, at the instigation of the Acting Attorney-General, Senator Daly, appointed Evatt to the bench of the High Court of Australia, and he went on to become a distinguished jurist and author. By 1940 it was known that he would be willing to present himself as a Labor candidate at the next federal election if the New South Wales executive could smooth his way into the House of Representatives by endorsing him as the Labor candidate for a winnable seat. But no sitting members (including the future Prime Minister, Ben Chifley) showed any enthusiasm for resigning in his favour. It was possible to think of the electorate of Barton as a seat that a candidate of Evatt’s stature could win. Its incumbent was Albert Lane, who had held the seat for the United Australia Party since 1931, and had improved his majority after a redistribution in 1934. At the 1937 elections he had won 49.3 per cent of the primary vote; Labor won just over 40 per cent. If it had an outstanding candidate, Labor might close the gap. William James Large was not an outstanding candidate, but (helped by his local trade union and masonic connections) he had won the preselection ballot held before Evatt finally made up his mind to resign from the High Court. Negotiations followed: Evatt became the officially endorsed Labor candidate for Barton, and Large an officially endorsed Labor candidate for the Senate. The party explained that the ‘need for victory in war and security in peace is so paramount that ordinary conventions should not be allowed to prevent the Labour Party from seeking help from the ablest citizens’. The Propeller reported that Mr Large had ‘stood aside for Dr Evatt . . . actuated by a spirit of loyalty to his party and to the country’s needs’. Both men won easily. Large took his place in the Senate in July 1941, and remained a senator for the next ten years. Unlike Evatt he rose to no great heights, nor did he sink into the depths. As he had been a sound party man, so was he a sound backbencher. He was a member of the Joint Committee on Profits from November 1941 to 1943, a member of the Senate Standing Committee on Regulations and Ordinances from November 1941 to October 1947 (which he chaired between October 1943 and August 1946), and a member of the War Expenditure Committee from September 1943 until it was wound up in 1946. He led the Australian delegation to the first session of the Building, Civil Engineering and Public Works Committee of the International Labour Organization at Brussels from November to December 1946. He left his fellow senators in no doubt about his political philosophy. By the time he was elected, he had been ‘a convinced socialist’ for many years. He believed that capitalists formed one social class, and working men another, each with distinct political interests; the United Australia Party represented the former, and the Labor Party the latter. The power of the capitalists extended into the judiciary, so it was necessary for working men, through strong trade union organisation, to counter the power of biased judges. There was no such thing as a ‘free market’; ‘octopus groups’ controlled supply and demand, and it was their greed and shortsightedness that had led to the great ‘man-made’ Depression of the thirties. He was convinced that only the Labor Party was ‘actually a buffer between the people and the red revolution’. Nonetheless he was defeated at the election following the simultaneous dissolution of 1951. William James Large was the ideal craft union political man. He took pride in his work as a skilled tradesman, and in the contribution that work could make to a better society. He believed that knowledge was power and had himself ‘given considerable study to economics’. He had faith in the ability of the working class to improve itself through education, and in its power through better understanding and democratic action to bring a new order out of the old. To that end he worked not only as a senator, but as an official of his union, unpaid, for more than thirty-two years. He died on 2 March 1964 at Blakehurst Convalescent Home, Blakehurst, his wife having predeceased him. Survived by his daughter Claire, Large was cremated at Woronora Cemetery, the rites conducted in accordance with the Church of England. Until shortly before his death, he had remained in his home at South Hurstville, a New South Wales man to the core, having once observed that ‘what New South Wales does to-day the Commonwealth does tomorrow, and the rest of the world does a month later’. CPD, 19 Oct. 1950, p. 1064, 9 Dec. 1948, p. 4238, 24 Sept. 1942, p. 813, 15 Sept. 1944, p. 876, 16 Feb. 1944, p. 218, 8 May 1947, p. 2078. CPD, 19 Oct. 1950, p. 1065, 13 May 1942, p. 1091, 8 May 1947, pp. 2078–9, 23 Sept. 1942, p. 786; Branch records and photograph, AEU, E221/111, N24/832, Noel Butlin Archives Centre, ANU; Hurstville Propeller, Sept. 1940; SMH, 11 Aug. 1917, p. 11, 15 Aug. 1917, p. 10, 27 Aug. 1917, p. 7, 30 Aug. 1917, p. 8, 5 Sept. 1917, p. 9. DT (Syd. ), 7 Sept. 1940, p. 6; Peter Crockett, Evatt: A Life, OUP, Melbourne, 1993, pp. 91, 327; L. F. Crisp, Ben Chifley: A Biography, Longmans, Green & Co., Croydon, Vic., , p. 127; DT (Syd. ), 4 Sept. 1940, p. 5; SMH, 27 Aug. 1940, p. 9. CPD, 3 Mar. 1964, p. 159; CPP, Joint Committee on Profits, second report, 1942, Joint Committee on War Expenditure, reports, 1944, 1946; SMH, 7 Nov. 1946, p. 5. CPD, 19 Oct. 1950, pp. 1064–5, 9 Feb. 1949, pp. 36–7, 6 Oct. 1948, pp. 1212–13, 1216, 22 Mar. 1944, p. 1714, 23 Sept. 1942, p. 784, 19 Nov. 1941, p. 537, 25 Sept. 1941, p. 547; SMH, 4 Mar. 1964, p. 36; Minute book, Hurstville Branch, AEU, E162/57/2, Noel Butlin Archives Centre, ANU; CPD, 3 & 4 June 1942, p. 1966. This biography was first published in The Biographical Dictionary of the Australian Senate, vol. 2, 1929-1962, Melbourne University Press, Carlton, Vic., 2004, pp. 443-446.